Despite the weather conditions we had a wonderful turnout on October 20 for the Ebenezer Baptist/MLKing, Jr. Tour. We had 41 attendees with 26 students coming by Uber/Lyft, MARTA, or personal vehicle to the event to learn more about Atlanta especially the legacy of Rev. Dr. Martin Luther King, Jr. The students came from seven different colleges and universities (Emory, Columbia Theological, Agnes Scott, Georgia State, Kennesaw State, Spelman and Georgia Tech) to participate in the event. We were warmly greeted by AMIS Board members from Ebenezer Baptist where students enjoyed meeting one another and Americans. Afterwards, students were paired with Americans to tour the King Center and Historic Ebenezer Baptist Church before touring the King Family birthplace at 4pm. Thanks to each person that participated in this wonderful event! Aunt Louise: Hello there! We hope you’ve had a great summer! Uncle Bob: The yellow school busses are stopping for the kids in our neighborhood, so we figured it was about time for our International Student friends to get back, even though it’s still so hot, it just doesn’t seem right to be getting back to school! Aunt Louise: That’s right, Bob! When we were going to school, or were young parents getting our daughter to school, the school year started in September, when the weather was a little cooler. But as our grandchildren became students, school seemed to start earlier each year. Uncle Bob: It’s no wonder the stores start selling school supplies right after the July 4th Parades! We hope you got to see a parade with a marching band. That’s a lot of fun! Aunt Louise: We hope you got to see a baseball game, even though it was probably very hot! These days, Bob and I like to watch our Atlanta Braves baseball on TV. Uncle Bob: They say baseball is as American as apple pie, one of my favorite treats. When I was a boy, we would make 1st, 2nd and 3rd bases out of a piece of cardboard, and sometimes our bat was just a stick. All the neighborhood boys would be in somebody’s yard playing. Aunt Louise: Some of the girls, like my sister Flo, loved to play baseball too. Seriously, though, we’re glad you’re back. We know you’re all busy, but be sure to come to the Welcome Reception on Saturday, September 8, 2-4 p.m., at the Georgia Tech Student Services Ballroom. There will be music, good food and new friends to meet. You will receive information for the upcoming Braves Game, the Amigo program and Christmas International House. Please invite new international students to come as well. Uncle Bob: Now remember, you can write and ask us anything you want to know about American customs, by writing to Aunt Louise and Uncle Bob at office@amis-inc.org. Just think of us as your American Aunt and Uncle! Now Louise, do you think you could bake that apple pie? It really is my favorite treat! Uncle Bob and Aunt Louise are a traditional southern couple, kind, easy to talk with, not too fancy, but they like to do things “the right way.” Uncle Bob washes the car and tends the garden and his beloved rosebushes. Aunt Louise keeps a clean house, embroiders and crochets. Since they’ve retired, they enjoy going out for breakfast—chicken biscuits are a great treat, but it’s hard to bake just two! So why would you want to know Aunt Louise and Uncle Bob? Perhaps you have a question about American or Southern culture or etiquette, but don’t know whom to ask. Aunt Louise and Uncle Bob are ready to help! Send your questions via email to Aunt Louise and Uncle Bob at office@amis-inc.org. Uncle Bob: So a couple days ago, we told you a little bit about the traditions and celebrations of Passover. Today we will answer the second half of our student’s question by sharing about Easter, a celebration that is both Christian and secular. Aunt Louise: The Christian observance of Easter actually started 40 days before Easter, on a day we call Ash Wednesday, which this year was on Valentine’s Day. The season of Lent starts then, lasting 40 days, until Holy (or Maundy) Thursday, just before Easter Sunday, which this year falls on April 1. Uncle Bob: And that’s no joke! (April Fools Day, always occurring on April one, is a very silly observance where folks trick each other with a falsehood, then say “April Fool!” It has absolutely nothing to do with Easter, yet this year they’re on the same day.) Seriously though, 40 is an often-used number in both the Jewish and Christian traditions. It generally means a period of testing, trial or probation, and can also represent a generation. Christian Churches vary on observance, the more formal churches more, many of the casual or contemporary ones less, but all are getting ready: Easter is coming. Aunt Louise: The word “Easter” comes from the Greek and Latin “Pascha.” It celebrates the resurrection of Jesus from the dead, having occurred on the third day after crucifixion (a horrible prolonged death on a cross) by Romans at Calvary c. 30 AD, as described in the New Testament (the second part of the Christian Bible). It is celebrated in the Western Hemisphere on the first Sunday following a full moon after the vernal equinox on March 21. Uncle Bob: That’s why Easter (and Passover) have different dates each year, they’re determined by lunar calendars. Passover is determined differently from Easter, but usually they are the same week. I only remember one time (in my lifetime) they did not. Aunt Louise: And now you know why most Christian churches have a cross, or many crosses on and inside their buildings. Catholic churches show Jesus still on the cross and are usually fancy. The more modern denominations (branches or different groups) have an empty cross, and could even meet in an office building. They are different, but all are celebrating and remembering. Uncle Bob: And now for the fun symbols of Easter, why don’t you start with the eggs, Louise? Aunt Louise: The egg, in many religions, is a symbol of new life or fertility. Christianity has an additional meaning as a symbol of Jesus’ resurrection or rebirth. The egg is a good shape for decorating—a popular activity to do with children, and popular with folks who like to do crafts. Egg hunts are a lot of fun, with either boiled/decorated or candy eggs. The first Egg Roll (an egg race for children) occurred at our president’s White House in 1878. Uncle Bob: My favorite is the Easter Bunny, who comes at night, leaving candy eggs and chocolate bunnies in good children’s Easter baskets! The Easter Bunny has been around in the USA since the 1700’s, started by German Immigrants in Pennsylvania, whose “Osterhase,” an Easter hare, laid colored eggs. Eventually, chocolate bunnies, marshmallow peeps (you must try one–folks either love them or think them too sweet!) and other candies joined the boiled and decorated eggs in children’s Easter baskets. Aunt Louise: There are several classic books and songs—my favorite is “Peter Cottontail” and a few movies, mostly for children, but not all. Uncle Bob: I enjoyed singing “Easter Bonnet” to you after we saw Judy Garland and Fred Astaire in “Easter Parade”—that was a great movie! Aunt Louise: Yes, dear. So, Students, in a little over six weeks, you will have had the opportunity to experience six American holidays or observances: Valentine’s Day, Ash Wednesday/Lent, St. Patrick’s, Passover, Easter and April Fools. Uncle Bob: We hope you have a chance to enjoy several events, whether you choose the meaningful or silly ones. Have a happy spring! Dear Aunt Louise and Uncle Bob: Hi! It’s me again, the student who is always asking questions about holidays. So my question today is about Passover, which I know is a Jewish holiday. I would also like to know about Easter, which seems to happen at the same time, with unusually colored animals and seems to be Christian. Can you share some information with me? Aunt Louise: Bob and I are happy and flattered that you find it easy to come to us with your questions, and you’re so engaged here in the US during your stay as an international student. Not all education comes from the classroom or a textbook-and you seem to be noticing culture around you! I think we should break this into two subjects, as Passover and Easter are two distinct events, occurring at the same time. Bob, what do you know about Passover? Uncle Bob: Passover is a seven-day Jewish holiday and the most-celebrated one of the year. It is in some ways a “multi-purpose” holiday. First it is a celebration of spring and birth (as do many other religions and belief systems); but it is also a celebration of the journey of the Jewish people from slavery in Egypt to freedom. And it is also about taking responsibility for oneself, one’s community, and the world. The Torah (think of it as the official “book” of Judaism) tells Jews they are to observe Passover for seven days, with the first night including a ritual dinner called a “seder”. If you are invited to a seder, go! – the experience is interesting and because children are always included, there will be much explanation of what is going on. You will find this quite interesting, you will be warmly welcomed, and the food is good. Our niece and her family have been to several seders, and enjoyed them! Aunt Louise: Nowadays there are community seders, not just ones held in the homes of Jewish families. Do an online search of “community seders in atlanta 2018” (or other city) and you will find opportunities to share in this Jewish ritual. One unique item is the seder plate with symbolic decorations, which is at every table. The plate may be an ornate family heirloom or a paper plate decorated by the children. You will find the shankbone, karpas, chazeret, charoset, maror, and egg on the plate. Roasted egg: The roasted egg (baytsah) is a symbol in many different cultures, maybe even yours, often signifying springtime and renewal. One interpretation is that it represents one of the sacrificial offerings which was performed in the days of the Second Temple. Another popular interpretation is that the egg is like the Jewish people: the hotter you make it for them, the tougher they get! This egg isn’t even eaten during the meal; the shell just needs to look really roasted. Maror (“bitter herb”): Any bitter herb will work, though horseradish is the most common. Bitter herbs bring tears to the eyes and recall the bitterness of slavery. The seder refers to the slavery in Egypt, but you are expected to look at your own “bitter enslavements” such as addiction or a bad habit. Charoset: There’s nothing further from maror than charoset (“kha-ROH-set”), a sweet salad of apples, nuts, wine, and cinnamon that represents the mortar used by the Hebrew slaves to make bricks. Karpas: Karpas is a green vegetable, usually parsley (though any spring green will do). While karpas may symbolize the freshness of spring, others say people eat it to make them feel like nobility or aristocracy. Because the seder ritual is to be personal, you might find that some families use boiled potatoes for karpas, continuing a tradition from Eastern Europe where it was difficult to obtain fresh green vegetables. Chazeret: The chazeret (“khah-ZER-et”) is a second bitter herb, most often romaine lettuce, but people also use the leafy greens of a horseradish or carrot plant. The symbolism is the same as that of maror. Salt water: Salt water symbolizes the tears and sweat of enslavement, yet it’s also a symbol for purity, springtime, and the sea, the mother of all life. Often a single bowl of salt water sits on the table into which each person dips their karpas during the seder. Then, it’s traditional to begin the actual seder meal with each person eating a hardboiled egg (not the roasted egg!) dipped in the bowl of salt water. Matzah: Perhaps the most important symbol on the seder table is a plate that has a stack of three pieces of matzah (unleavened bread) on it. The matzot (that’s plural for matzah) are typically covered with a cloth. People have come up with numerous interpretations for the three matzot. Some say they represent the Kohen class (the Jewish priests in ancient times), the Levis (who supported the priests), and the Israelites (the rest of the Jews). What symbolism you attribute to this trinity isn’t all that important, as long as you’re thinking about it. Wine cups and wine (or grape juice): Everyone at the seder has a (usually very small) cup or glass from which they drink four cups of wine. Traditionally, the four cups represent the four biblical promises of redemption: “I will bring you out from under the burdens of the Egyptians, and I will rid you from their slavery, and I will redeem you with an outstretched arm, and with great judgments. And I will take you to me for a people . . .” Others say the four cups represent the four letters in the unspeakable Name of God. Uncle Bob: How interesting this is, Louise. Now I am thinking we should find a seder to experience this Spring…the official day is March 30, but there are seders that are held throughout the seven day celebration. Let’s do that! Aunt Louise: I think we should, Bob. We should take a lesson from our inquisitive student who asking about and learning about new things…. 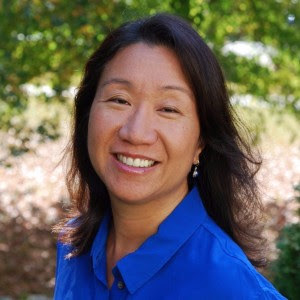 I am delighted to introduce you to Irene Wong, our new AMIS Executive Director! Irene comes to AMIS with a unique combination of experience, education and interests in non-profit leadership, student ministry, volunteering, and international programming. She currently serves as President of the Parent Teacher Association at Teasley Elementary School. With this experience, Irene brings to AMIS demonstrated success leading a non-profit through changing times, supporting volunteers, and delivering on its mission. Irene also has years of ministry experience, including international and student ministry. Irene started with AMIS on Wednesday, August 23, just in time for the start of our new program year. The Executive Director position is now a part-time role, and Irene will set “in-office” hours after a period of orientation. Her contact information is irene@amis-inc.org or 404.846.4395. I want to take a moment to thank our Program Administrator Dené Dixon for the outstanding job she has done, keeping AMIS going and preparing for the program year. Irene and Dené will be a great team. I hope to see you at the September 16 Welcome Reception. Come and meet Irene, welcome new and returning international students and scholars, and reconnect with others in the AMIS family! As a third generation American of Chinese descent, Irene has had a life-long interest in international cultures. She grew up in New York City and majored in East Asian Studies at Brown University. In college, she joined InterVarsity Christian Fellowship where she developed a passion for campus ministry. She spent a year teaching English in China before serving as a campus staff with InterVarsity Christian Fellowship for eight years, during which time she started an international student ministry at Brown, led summer Global Projects to China, and became a new staff fundraising trainer. In 2000, she moved to Atlanta to work with InterVarsity at Emory University. After that, she went to Fuller Theological Seminary for a Master of Divinity, and then returned to Atlanta to marry her husband, who she met in Atlanta. Irene was a Ministry Director at the Atlanta Taiwanese Presbyterian Church for 3 years before stepping away from professional ministry after her second child was born. Even as a stay-at-home parent, Irene has been an active volunteer at her church and local public school. At North Avenue Presbyterian Church, Irene has been an active elder involved with International Student ministry at Georgia Tech, Children and Family Ministries, and Strategic Planning. Irene is a Candidate for Ministry in the Presbytery of Greater Atlanta. Irene and her husband, William, have three daughters ages 11, 9, and 6 and spending time with her family is one of Irene’s greatest joys. The search for the AMIS Executive Director is well underway. A small group of AMIS Board members is serving as the search committee. The first activity was the development of the position description, using input from the AMIS strategic plan the Board and staff developed in 2015, insights from both our former Executive Directors, and guidance from the Georgia Center for Nonprofits. With this in hand we posted the position on a several internet sites, and asked our network of volunteers and supporters to also suggest candidates. We are enthused by the number of interested applicants and their qualifications. Every resume was reviewed and the search committee held phone interviews with many of the best matches. As I write this, the search committee is meeting a few of the candidates for face-to-face interviews and we hope to come to agreement with the right candidate – for AMIS and our students – in the near future. All understand AMIS’ value, the services provided to students, and opportunities and challenges, and embrace and support the AMIS mission. Our programs start up in the summer as international students arrive in the U.S. for the fall term, and with plan in we would like to have the Executive Director in place, to fully participate in these activities. While the search is underway, our AMIS services continue. Amigo volunteers recently said goodbye to students finishing the spring term at Atlanta-area colleges and universities. The Board honored 4 members who are finishing their terms in June. Under Program Administrator Dené Dixon’s leadership, planning is underway for all the events that take place in the summer and early fall as the school year begins. Dené is handling the programs in her consistent, caring, and competent style. We are thankful for Dené and her commitment during this transition time. As we prepare for our programs to restart, and the pending welcome of an executive director, the AMIS mission – to promote cultural understanding through friendship and hospitality with international students in the Greater Atlanta area – is more important than ever. On behalf of the Board, we are grateful for each volunteer and supporter and appreciate your continued commitment to the students.